March 12, 2015 -- Despite a relatively slow start to the 2015 season, Texan Steve Torrence remains enthusiastic about his bid this year for the Mello Yello Top Fuel championship. 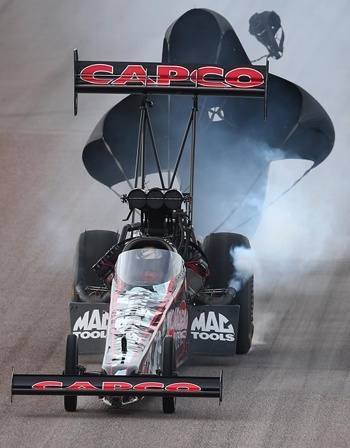 Unlike 2014, when he raced to the semifinals in six of the season’s first seven races, the 31-year-old brings his Capco Contractors dragster back to Auto-Plus Raceway at Gainesville having won just one round in the season’s first two races. Nevertheless, the graduate of Kilgore College believes his team can turn things around at this week’s 46th annual Amalie Oil Gatornationals, especially since it marks a return to the state in which his car tested so impressively last January. “This year’s test session in West Palm was probably the most successful we’ve ever had and Pomona (the season-opening Circle K Winternationals) and Phoenix (the CARQUEST Nationals) did nothing to discourage us at all,” Torrence said. “The deal is, it’s just hard to win in this class, especially with all the multi-car teams. But we know we can compete. It’s the same race car he brings back to the Gatornationals, a race in which he was beaten in the semifinals last year when he lost traction against the Mac Tools entry of Doug Kalitta. “With Richard Hogan (making the tuning decisions), we have a rocket ship,” admitted the 2005 NHRA World Champion in the Top Alcohol Dragster class. “The reason we didn’t go to more finals last year is we would go out there and smoke the tires in the semis. Torrence and Hogan form an imposing tandem, one that not only clicks on the racetrack but off of it since both are avid outdoorsmen. “Richard and I get along great. We have a great working relationship while also being really close friends,” Torrence said of the crew chief who got his start working with Florida legend “Big Daddy” Don Garlits. “When we’re at the racetrack and running the car, though, it’s all business. “(Richard) is a pretty conservative guy. He doesn’t go up there and throw ‘Hail Marys’ all the time. He races the track and the car beside me,” Torrence said. “That’s what it takes. It takes somebody who is not going to go up there to set low ET every time but somebody who is racing the lane and knows what we can get away with. Hogan, who has turned the wrenches for some of the biggest names in the sport, has been with Torrence for all but one of his four NHRA Top Fuel victories. Ironically, though, he did his best work last year, keeping Torrence solidly in the title race even though the team didn’t win a single race. In fact, Torrence and Hogan were just a couple of good breaks away from finishing second to Tony Schumacher in the title chase.